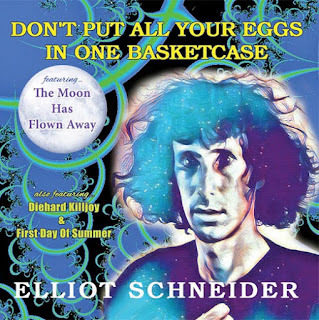 "The Moon Has Flown Away", off of the album "Don't Put All Your Eggs in One Basketcase", from joyous classic rock artist Elliot Schneider is a tune to not be missed. As his lyrical and melody content is reminiscent of the 60's to 70's classic rock age to dating back, to the styling's of The Beatles, The Stones, and even Elvis Costello. That being said, "Don't Put All Your Eggs in One Basketcase", is of course the album where "The Moon Has Flown Away", comes from and happens to begin said album. The song is the right track to do this, as it opens up the album for pure possibilities. The album itself has to offer your average amount of tracks, there are 11 original tracks available, while the remaining portion is a mix-up of live recordings to demo works. But that is just for those who want to go forth and pick up the album itself. For the likes of this track itself though, it does give you the glimpse into what you can expect to hear on this album. Like previously said, is reminiscent of that time period that once was of the 60's to 70's era of music. Hearing Elliot's vocal chords and melody of tone with his music making, is just flawless pieces of work. While it is just song to be had right here, it just has so much going for it. The music itself really does take you back to a time of the past especially in those time frames with this song. It has such an upbeat and appealing melody that it draws in the listener. Just hearing the melodies brings you back to that time period instantly. It is so moving to hear, really the ways of his words, in which Elliot Schneider once said in 1977: "'The pen is mightier than the sword?"' Words ARE a sword. Just move the 'S.'" That alone really sets the scene and tone for not just this song, but his music in general over the years. The song and album that accompanies it, are very likely in the same style to that of the acts mentioned prior The Beatles, The Stones, and Elvis Costello's work can all be heard within this song and the other material that Elliot has released. The styles clash together to bring together a whole mixture of a time that once was alive and well and still is within this track in particular. A lot of others have said great things about Elliot's works, including such as "Excellent stuff that guy's got swagger!" to other notes like "I've been loving your new CD/music. I cranked it up all the way home. I keep it close in my car for instant pick up", from the BBC Radio Merseyside and a DJ at KFOG. So you see how much reaction Elliot's work has done for these people among others. His music is so tops. When it comes down to it "The Moon Has Flown Away", is another one of those tracks to take you across the lengths of space and time, with its tone, melody, and movement of such touching yet moving music.